If you’re sick of diets and long to learn how to lose weight permanently, this post will walk you through 5 steps I use to help my coaching clients be successful. Have you ever thought about how nice it would be to train like a celebrity who has a personal coach to manage their exercise and nutrition? It really does sound dreamy! As we daydream, we miss the fact that no one can actually do the hard work for us. The best weight loss coaches are the ones that spur their clients onto greatness rather than trying to push them there. Sure, having someone prepare all of your healthy meals would be amazing but it would teach you nothing about how to plan, shop, prep, and prepare nourishing foods. Below I am going to share a little bit with you about what makes great coaches truly great. Then I’ll introduce you to a new resource that will help you find that “Hollywood” place of your own. Whether bound to a gym contract or just feeling obligated, there were some folks who truly did not want to lift weights. They felt like they “should” be burning calories or that they “must” work out. And so, they found themselves with me in the gym. They came, I counted their reps.
As a trainer, I did my best to draw out the client’s intrinsic motivation. You can’t help but wonder– what was deep inside that person that compelled them to show up to the gym when it was the last place on earth they wanted to be? There was a good reason, I just needed to help them find it. It is the same with you and me. Even though some days it feels like we’re swimming upstream, we’ve our reasons for wanting to be our best selves. In coaching, we uncover our deepest motivations and learn from the times we veer off course from them. If you’re sick of the diet drama and the ups and downs that come from all-or-nothing eating that leads to overeating, it’s time to make permanent changes in your life. Here are 5 essential approaches that I use while coaching clients that can revolutionize your health and fitness journey. I’ve added personal application questions so that you can also use this proven coaching method in your own life. One of the reasons coaches are so helpful is because they offer us an outside perspective. You know how you can see circumstances a lot more clearly in someone else’s life? This is what outside observation can do. You see, we’re often so close to our challenges that we can’t see a solution. Our emotions and negative self-talk get in there and really muddy things up. By mentally taking a step back and seeing your life as if it were playing on a movie screen, you can get a grasp of the big picture of change. While we are called to have discretion in our lives, pessimistic self-judgment can be a huge roadblock to progress. While berating ourselves may seem like it would motivate change, it does just the opposite. When one feels incapable of attaining new hopes and new dreams, why would they bother even trying? If you are a Christian, then you know we are instructed that condemnation has no value. Labeling our behaviors or worse yet- ourselves in a negative light does no one, no good. Allow your heart to be convicted to improve but keep away from the tunnel vision that foregoes your identity in Christ. PERSONAL APPLICATION QUESTION: If a dear friend was struggling with those same 3 health and weight loss challenges, what would you tell her? How would you encourage her to not give up? Why did you even start reading this blog post? You, my friend, have a fire for more than just another diet within you! First, let’s take a moment to recognize your resilience. You could have given up a long time ago and yet here you are, showing up to make your goals happen. Obviously, healthy habits are important to you. You just need better tools to get to where you want to go. PERSONAL APPLICATION QUESTION: What are your top 3 values in life? How do those values relate to your health and weight loss goals? Write out 3 goals informed by your values. Now that you have seen why you want to achieve your goals, it is important to choose a doable way to get where you want to go. Diets fail us in their drastic measures. 99% of us need slow, sustainable changes that we can gradually assimilate into our lives. This means choosing dietary, exercise, and other life-enhancing habits that you feel completely confident that you can implement. Ask yourself– “On a scale of 1-10 how confident I am that I can do this chosen habit-practice for the next 30 days?”. If you are less than an 8, adjust your plan. I know that it seems counterintuitive to pull back when you’re so ready to move forward. But, these smaller bites will allow you to learn all that is required to adopt this new way of life one step at a time. You’ll become confident in your ability to change as each of these new practices become your new normal. PERSONAL APPLICATION QUESTION: Visualizing where you are today and where you want to go, what is one small step you can take towards your goals? Are you 90-100% confident you can do this for the next 7 days? (If not, adjust) We’ll call this your “habit” to practice. Great coaches and trainers make results-based decisions. This simply means that they look at the outcome of the chosen practice and adjust from there. They don’t make assumptions, they measure results and tweak their plan or approach, as needed. This is a great place to visit point number 2 again! If your week or month doesn’t go as planned, don’t sweat it. Evaluate what went well and what could use some improvement. Adjust and move on. Don’t let slips keep you down. They happen to every single one of us. But, those who are successful that the slip “be.” They steer clear of all-or-nothing eating and reset as soon as possible. While its great to read resources that affirm our desired way of thinking, just reading about them won’t transform our lives. What we need is introspection, planning, practice, and reevaluation. 1. Set aside 15 minutes a day for the next 4 days to review sections 1-4. Each day, journal your answer to the personal application questions. 2. Practice your new “habit” for 1 week, taking note of what helps and hinders. 3. Take 15-minutes to reevaluate and refocus for the next week. Rinse and repeat. As you can see, great coaching isn’t about fancy tactics that create instantaneous success. It’s about living real life in an intentional way, allowing setbacks and successes to become equally informative in your process. It’s not about perfection, it’s about persistence. If you like the way this approach to reaching your goals sounds, I would encourage you to check out this fantastic resource that I created to help guide you along the way. 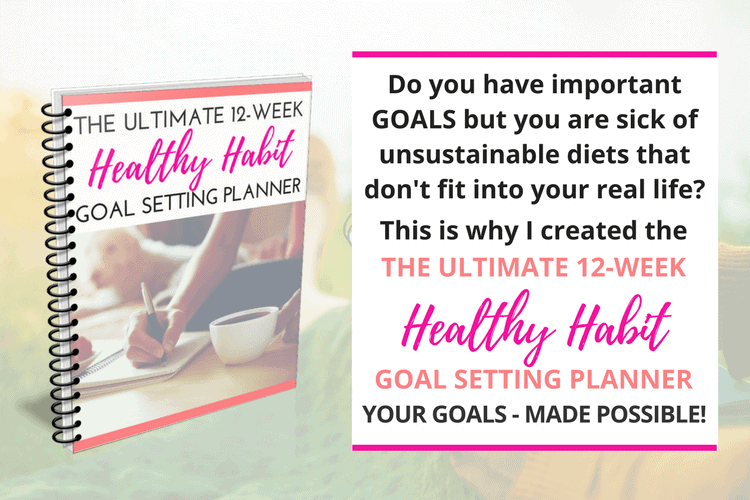 The Ultimate 12- Week Healthy Habit Goal Setting Planner is more than just an e-book. It’s a guide that will walk you through the process of habit change just like the best coaches in the world do! 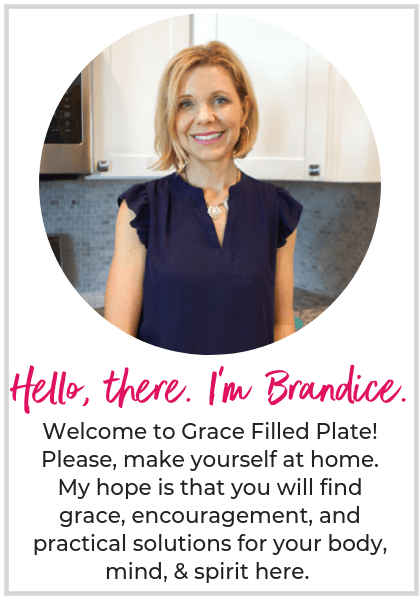 Brandice Lardner is a Certified Personal Trainer, Nutrition Coach, Author, and Jesus Girl whose mission in life is to help women ditch the diet mentality and find peace with food and their bodies so that they are better equipped to do the great things God has called them to do. Stop Dieting & Do This ONE Simple Thing Instead!